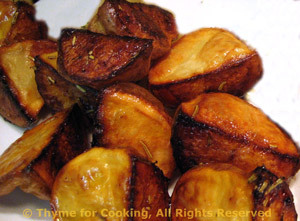 White Balsamic Roasted Potatoes, Thyme For Cooking easy potato side dish. When deciding how many potatoes to use I visualize them on my plate, then multiply by the number of people. I make these lots and very the herbs according to the rest of the meal. They get a lovely golden brown and a bit crispy, especially if you take the time to turn them. Put remaining ingredients into a bowl and mix well. Bake at 400F for 30 minutes. You can turn once if you like to fuss but I usually don't bother. Remove from oven and serve.